When the summer sun is shining, keeping cool becomes a top priority for Brits - especially caravan owners. Dometic cool boxes always come to the rescue when you need to keep your beer and BBQ food cool, which is why they are so popular. When the sun is beating down and you don't want to have to keep toing-and-froing between your deckchair and your caravan fridge, Dometic and Waeco coolboxes come into their own. Multi-compartment, spacious, extremely efficient, they will ensure that food and drinks are kept at a perfect temperature - regardless of what the unpredictable British weather is doing. The range of Dometic and Waeco cool boxes on the market is extensive and there are even a number of excellent alternatives, so you'll be spoilt for choice when you browse leisureshopdirect.com. But one thing is for sure: When you buy quality you will become the proud owner of a coolbox that works in the most demanding of conditions. So whether you're chilling beer and wine, keeping those BBQ prawns at a safe temperature, or simply stopping your milk from curdling, then Dometic and Waeco coolboxes are an ideal solution. What makes Dometic and Waeco cool boxes so good? The broad range of products available from Dometic/Waeco makes their cool boxes a great choice for every level of caravan holidaymaker. The Dometic Combicool RC1200 EGB is a perfect campers coolbox choice. 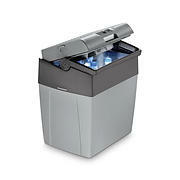 The RC1200 exemplifies the Dometic cool boxes approach. Make a solid, reliable and functional coolbox that outperforms all competitors. 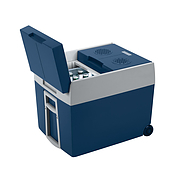 Like all Dometic coolboxes, the RC1200 achieves low temperatures with the minimum of fuss. 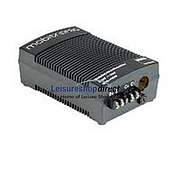 It is quiet, reliable and offers you a choice of power sources. 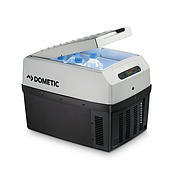 So keeping cool in the summer is no problem with Dometic and Waeco cool boxes. 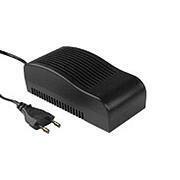 The RC1200 can run off a 12-volt power supply, a 230-volt mains supply or even butane and propane. Making it a flexible choice that is great for the outdoors. 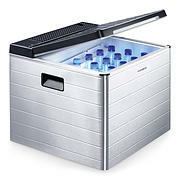 What's more the RC1200 can achieve temperatures 20 degrees C below ambient temperatures and like most Dometic cool boxes it can even make ice cubes for your drinks. 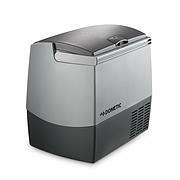 Meanwhile, the Dometic RC1700 EGP Portable Cooler is one step closer to cooling perfection. The device is bigger - with a 40 litre capacity - and can reach temperatures 30 degrees C below its surroundings. This means the Dometic and Waeco coolboxes range can cope with even the most amazing of British summers. 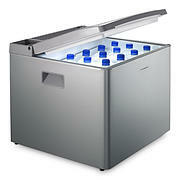 It is the leader among absorption refrigerators and is the choice when it comes to Dometic and Waeco cool boxes. 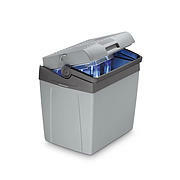 But, there are alternatives to Dometic coolboxes! 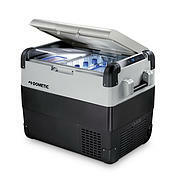 Dometic coolboxes are undoubtedly the yardstick by which other cooling devices are measured. 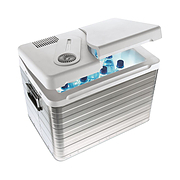 Get hold of any of the coolers in the Dometic cool boxes range and you won't need another cooler as long as you live - unless of course you need to keep even more BBQ food cold. 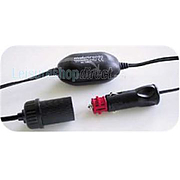 But, there are a number of alternatives that are suitable for slightly different situations. The Waeco range for example - which includes the Waeco Mobicool U32-12/230 Thermoelectric Coolbox, the Waeco W35-AC/DC Thermoelectric Cooler and the Waeco TropiCool TC-14FL Coolbox - gives the Dometic coolboxes offering a run for its money. 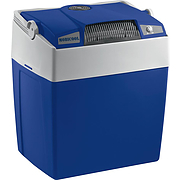 Like Dometic coolboxes, Waeco coolers can drop to anything up to 30 degrees C below ambient temperature and while they don't have multiple power source capabilities, they do have a number of other nifty features. The Waeco W35-AC/DC for example has a set of sturdy wheels, which makes transporting it a whole lot easier. Meanwhile, the Waeco Tropicool can also be used to things warm - making it ideal for when you're taking a caravan holiday in the winter months. 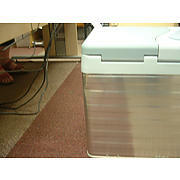 Waeco Thermoelectric Coolers, on the other hand, offers the ultimate in portability. 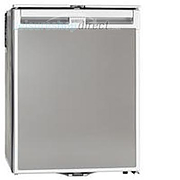 Making it an ideal candidate for people on the move, much like the Waeco S32 32L Thermocelectric Cooler. Most importantly, Waeco is now part of the Dometic cool boxes brand, so the same quality standards are applied to these ultra-portable solutions as they are to Dometic cool boxes. Caravan Waeco coolbox solutions are an essential part of caravan life regardless of the weather. When you're out and about on holiday keeping things cool is often essential. Fortunately, Waeco caravan coolboxes provide an excellent caravan cooling solution that is both efficient and affordable. 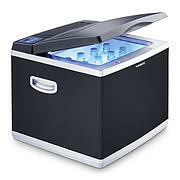 Keeping beers cool, stopping milk from curdling, stopping that cheddar from turning into blue cheese and having a little ice on hand when mixing up a Framboise cocktail often means relying on a caravan coolbox. And Waeco caravan coolboxes are a perfect place to start when you need a compact storage solution that will keep your fresh good fresh. One of the key selling points of the Waeco caravan coolboxes range is that it has coolboxes for practically every budget. That's is not to say that the low-end coolers compromise on quality. Far from it. 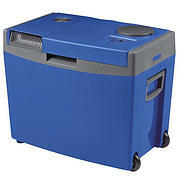 Budget Waeco caravan coolboxes offer a sturdy solution that is lightweight and portable. While there are other - often more costly - coolbox solutions available, the huge variety on offer in the Waeco caravan coolboxes range means that caravanners rarely have to look any further. If you want a solid, effective budget solution to you cold storage needs, Waeco caravan coolboxes could be just the thing for you. 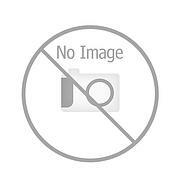 At the bottom-end of the Waeco caravan cool boxes range is the Waeco Mobicool U26 - 12 Thermoelectric Coolbox. This extremely effective device is a straightforward solution with absolutely no frills. But, like the rest of the Waeco caravan coolboxes, it offers a sturdy build that will last a lifetime. 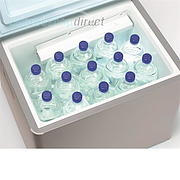 With the lowest price of any of the Waeco caravan cool boxes, the Waeco Mobicool U26DC Thermoelectric Cool box offers 26 litres of capacity and can easily hold 1.5-litre bottles. It is perfect for in-car use and like other Waeco caravan cool boxes, it is easy to find space for. Moving up the Waeco caravan cool boxes range and it is easy to see that a little more cash will get you a lot more storage. The Waeco Mobicool U32/V30 Thermoelectric Coolbox has a whopping 32 litres of storage capacity and is ideal for either in-car or in-caravan use. 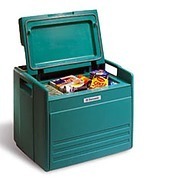 Like other Waeco caravan coolboxes, the U32 is good value for money. 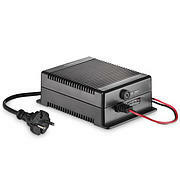 It is CFC-free and as it is thermoelectric can be powered by either a 12V or 230V power supply. 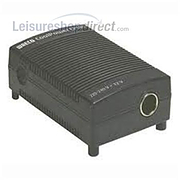 It is capable of keeping things 20C below ambient temperature and weighs just 4.2kg. The Waeco Mobicool U48 Thermoelectric Coolboxis one step up, has a similar cooling technology to the Waeco Mobicool U26-12 Thermoelectric Coolbox but offers even more storage space. 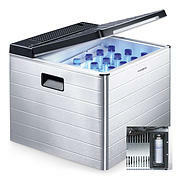 As with other Waeco caravan coolboxes, the priceis unbelievable - making it a cheap and versatile cooling solution. Waeco's TropiCool Thermoelectic Coolers are smaller and more suited to car journeys, but offer the same low temperatures and multi-functional power input as all the high-end Waeco caravan cool boxes. As you move of the Waeco caravan coolboxes range, the same build quality and value is on offer, but the technology under the hood is much more advanced. Pay more - with the likes of the Waeco TC35FL Thermoelectric Coolbox or the Waeco CoolFreeze CF-35 - and you get an excellent amount of storage with the latest cooling and heating technology. 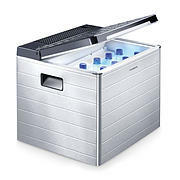 With the excellent products available in the Waeco caravan cool boxes range, it is easy to see why they are so popular. Good value, reliable, sturdy and compact they are the solution that springs to mind when fitting out a caravan on a budget. So if you need a quality coolbox without paying through the nose for it, look no further than the Waeco caravan coolboxes range. 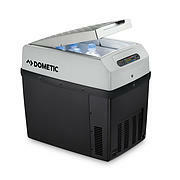 The Dometic F 400 EGP Coolbox, your home comfort far away from home. The best solution to store and to keep frozen food safe in all situations. 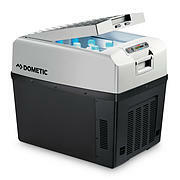 The Dometic RC 1700 EGP is the new Dometic standard portable refrigerator. 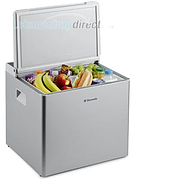 It has the biggest storing capacity of all absorption portable refrigerators. Able to store even eight 2 litres bottles. Dometic ACX40G with Gas Canister cradle . GAS CANISTER NOT INCLUDED. Be cool. Anywhere. Anytime. 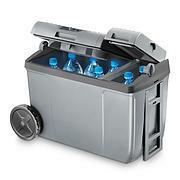 Wherever you want to go and spend some leisure time, bring your portable refrigerator with you. It will provide you with fresh drinks and food, even ice cubes.The cool boxes in this section include Dometic and Waeco Cool Boxes, thermoelectric, also called Peltier process. This system works on the battery car (12V) but can also be used on the mains or on 24V with the appropriate converter or adapter. They are designed to maintain cool food at normal ambient temperature. The thermoelectric boxes are the perfect solution for occasional use on board. 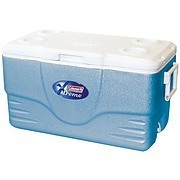 There are also absorbtion cool boxes available here.We do cool boxes from Dometic, Waeco, Igloo, Coleman & Royal.